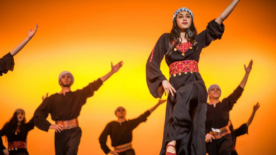 A group of young dancers and rappers from the Dheisheh refugee camp in the occupied West Bank are on tour, bringing original music, hip-hop and dabke folk dance to audiences across the US. The group of girls, ponytailed and dressed in pink, stretched their arms out to the sides and pivoted onto their toes, trying desperately to hold still. Eagle-eyed, the instructor surveyed Gaza's latest crop of would-be ballerinas. Fifty girls aged five to eight are now enrolled in the ballet school at the Al-Qattan Center for Children in Gaza, making it one of the most popular classes the arts institute runs, under the watchful eye of a Ukrainian teacher. Under the name El-Funoun Palestinian Popular Dance Troupe, Mohammad Yaacoub and friends Mohammed Atta and Wassim al-Kurdi embarked on a journey of interpreting Palestinian folk songs accompanied by dance and dabke (Levantine Arab folk dance) shows with the objective of preserving Palestinian heritage and folklore. Lina Khattab, 18, is in her first year of media studies at Birzeit University in the occupied West Bank. An accomplished dancer, she is a member of the renowned troupe El-Funoun. 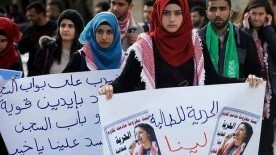 She was arrested by the Israeli military on 13 December as she joined fellow university students in a march to Israel’s Ofer prison, which holds Palestinian political prisoners. 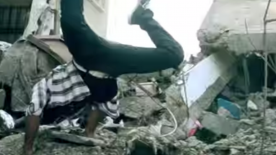 The residents of Gaza find different ways of coping with life under occupation, and for a group of young men that call themselves the CB (Camp Breakerz) Crew, dance is a hugely important outlet. The group has been an organized break dancing team for over 10 years, and in 2012, they decided to share their passion with the community by opening a school called CB Crew Academy of Art in Nusirat refugee camp.